In a most recent turn of events concerning the choices of a new Secretary of State to replace Hilary Clinton during President Obama's second term as President, the one person who most fills the bill has decided to withdraw her name from consideration. John Kerry most likely will now receive the nomination from the President. Why did she change her mind? It was because of a Republican controversy surrounding her name to be the nominee by President Obama. Susan Rice wrote a letter to the president and has decided to withdraw her name from the possible list of candidates. It was not a decision that the White House helped her with, rather than a self calculated decision to withdraw at this time. Her involvement surrounding the Benghazi issue had everything to do with her decision. Led by John McCain, the Republicans did everything possible to say that she was not qualified to do the job of Secretary of State, just because she did her job to report on Benghazi as she was told. She provided the best information that she had at the time, but the Republicans, led by McCain said that she was misleading and that she made mistakes in her reporting, thus she is not qualified to be the next Secretary of State. To me, the Republicans led by McCain himself should be ashamed of their actions. The only thing the Republican party now seems to represent is to block everything that President Obama wants, and this action is proof that the Republicans plan no changes on how they will think during the second term. Was Susan Rice truly qualified to become Secretary of State? I say that she is qualified and here is just a glimpse of her resume, someone truly educated, someone who should be considered the best of the best. 1) Served under Bill Clinton and was recommended that he tap Rice for a high-level State Department post on African affairs in the late 1990's. 2) Valedictorian of her class with "superior leadership skills: and "left behind a remarkable legacy" "that included a revised honor code still used at the school," John Wood wrote. 3) A Bachelors degree with Phi Beta Kappa honors at Stanford University while she also won a Rhodes Scholarship to study international relations at Oxford University in 1986. 6) At Oxford, she earned the Chatham House-British International Studies Association Prize for the top doctoral dissertation in the United Kingdom in international relations. 7) An international management consultant position at McKinsey and Company in Toronto, Canada. 8) Director of International organizations and peacekeeping in 1993 in Washington, DC. 9) In 1994, she toured the war-torn country of Rwanda after the genocide campaign there killed at least 800,000 people in a little over three months time. 10) In 1995, she became a special assistant to the president and senior director of African affairs at the White House National Security Council. 11) A senior fellow in 2002 at Brookings, specializing in the study of U.S. foreign relations. 12) National security and foreign relations adviser for Obama's 2008 campaign. 13) Became a U.N. Ambassador as President Obama called her "a close and trusted adviser" and said she "shares my belief that the U.N. is an indispensable -- and imperfect -- forum." 14) Washington insiders characterize her as being very ambitious and aggressive, very personable, likable, charming, smart, funny and down to earth. 15) Very serious and someone you do not want to cross or get in the way off, which some may say is to her advantage or something against her, but in any case, very determined to do her job well. Even after the false accusations by the Republicans led by John McCain, who apparently still seems to be upset for loosing the Presidential race to Barack Obama in 2008, still shows his resentment and apparently tried to make others feel as miserable as he most certainly is now. "I have every confidence that Susan has limitless capability to serve our country now and in the years to come, and know that I will continue to rely on her as an adviser and friend," the president said. 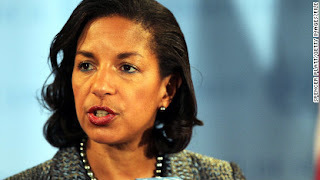 "While I deeply regret the unfair and misleading attacks on Susan Rice in recent weeks, her decision demonstrates the strength of her character, and an admirable commitment to rise above the politics of the moment to put our national interests first." It is just too bad that warmonger John McCain doesn't have the same interests, as he would rather be a warmonger and keep our troops in Afghanistan and Iraq, and is in favor of prolonging the wars. Just because he happened to serve in a prior war, and was a prisoner for a length of time, doesn't make him qualified to be Secretary of State, but thinks that it gives him the right to judge others. In recent comments made by John McCain, he felt that it was no ones business on the decisions he makes and openly stated the fact that recently in an interview and that others should not judge him. Instead, that gives him at age 76 the right as the judge and jury for Susan Rice. In light of a few of his most recent decisions, maybe it was good that he wasn't elected President in 2008.